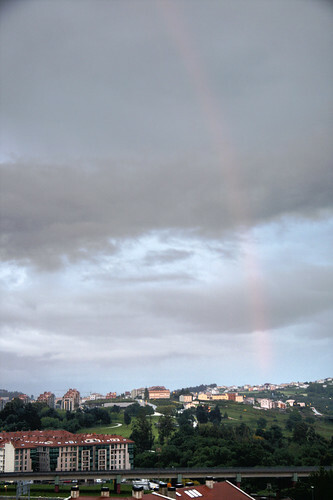 There are few benefits, besides a great deal of greenery, to having such a rainy climate, but we do get some rather fine optical phenomena here in Galicia. Yesterday evening as the sun was setting, the rain on the opposite horizon was still pouring and a redbow was in rather magnificent view from my window. As the sun sets and the light is refracted, the light which is reflected from the water droplets in a rainbow is mostly from the red end up the spectrum, and you end up with a redbow. Even after the sun had set we were still able to see this rather unusual phenomenon and I took a few snaps of it as it was disappearing. Not a perfect image, but enough to show that this really was a far redder bow than normal. See the atmospheric optics site for some more explanation and some better pictures, and keep an eye out for this rather fine vision next time the sun is setting.